BERKELEY, CA – It isn’t every day that a homebrewer gets the chance to upscale a recipe and brew on a commercial system under the guidance of a master brewer. But for one lucky California homebrewer, this dream became a reality. Bison Brewing, the 100% certified organic brewery based in Berkeley, CA, teamed up with New Brew Thursday, one of the internet’s most compelling and popular craft beer video podcasts, to co-present a homebrew competition. Roughly 60 homebrews were judged over the course of four months. The winner, Andrew Bell, was awarded the opportunity to brew his Zeal Island Pale Ale recipe with Bison’s Brewmaster, Dan Del Grande. Brewed with a blend of the palest malts, an excessive amount of New Zealand organic hops, the alcohol level of a Pale Ale and the hop content of a Double IPA, this unique creation is being classified a “New Zealand Pale Ale” (named for the region where its hops originated). “As an organic brewer, hops are the most expensive and least accessible ingredient for us to work with. Only 25% of the hop varietals used in brewing are available certified organic. This is why hop centric beers are the most challenging for us to brew. However, the organic hops coming from New Zealand are quite extraordinary, with many varietals being higher in alpha acids (the bittering component of hops) than many of the trendy American hops. We are really excited to release a beer that showcases the true tropical beauty of New Zealand hops.” — Dan Del Grande, Bison Brewing. win the competition was the hoppiest Pale Ale that I’ve ever tasted. I can’t wait to taste the final product.” — Dr. Bill Sysak, Master Pairings and Expert Drinking. And coming from a man that has tasted over 30,000 beers in his lifetime, this statement should not be taken lightly. Light-bodied and refreshingly crisp with a dry bitter finish; Bison’s Zeal Island Pale Ale is a perfect everyday sipper on its own, but also pairs well with a variety of foods. Suggested food pairings include: Fried foods, curries, jambalaya, jerk chicken, fresh seafood & shellfish, ceviche, spicy sushi rolls, fresh milk cheeses, South East Asian, Tahitian and Hawaiian cuisine. Recommended glassware: pint glass. “During the judging process, the statement was made that there is not a commercial pale ale in the craft beer market that is better than this beer.” — Stephen Johnson, New Brew Thursday. 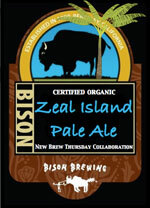 Zeal Island Pale Ale will be a competition entry at the Great American Beer Festival, not as Pro-Am, but as a commercial entry from Bison Brewing. It will also be served on the convention floor at the Bison Brewing table, alongside its other organic beers. As with all of Bison’s Limited Seasonal Releases, Zeal Island Pale Ale will only be available on draft in select markets. Green Bean Coffee was established to inspire a spirit of curiosity among coffee drinkers.